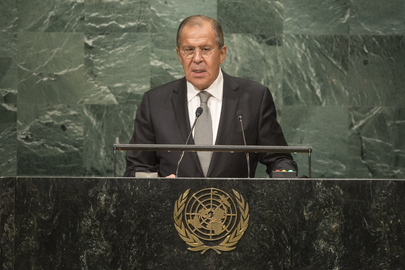 Sergey V. Lavrov, Minister for Foreign Affairs of the Russian Federation, addresses the general debate of the General Assembly’s seventy-first session. 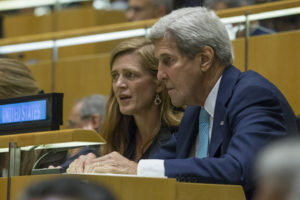 United States Secretary of State John Kerry with Samantha Power, US Permanent Representative to the UN, during the general debate of the General Assembly’s seventy-first session. But I wonder what lesson those now in power in the U.S. take from the dangerous and deadly events of 1983. 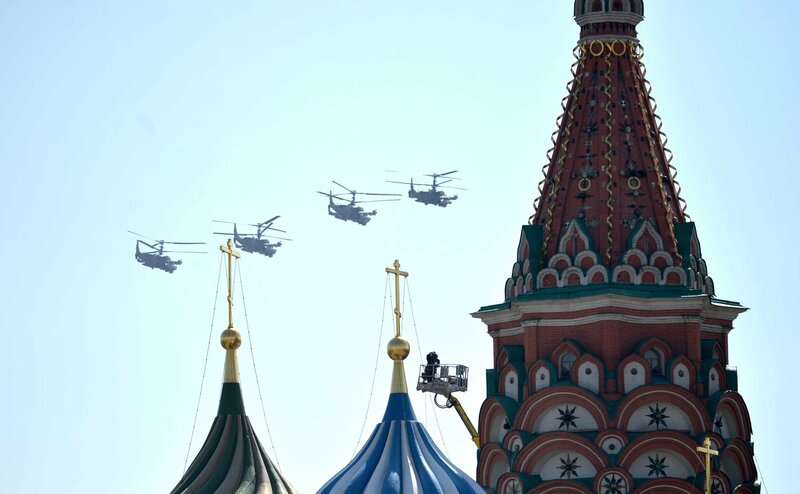 Within two years of the KAL 007 shootdown, the USSR had set its course toward collapse and surrender to U.S.-led militarism and predatory capitalism, a monumental change that is only now beginning to be corrected by Russia. 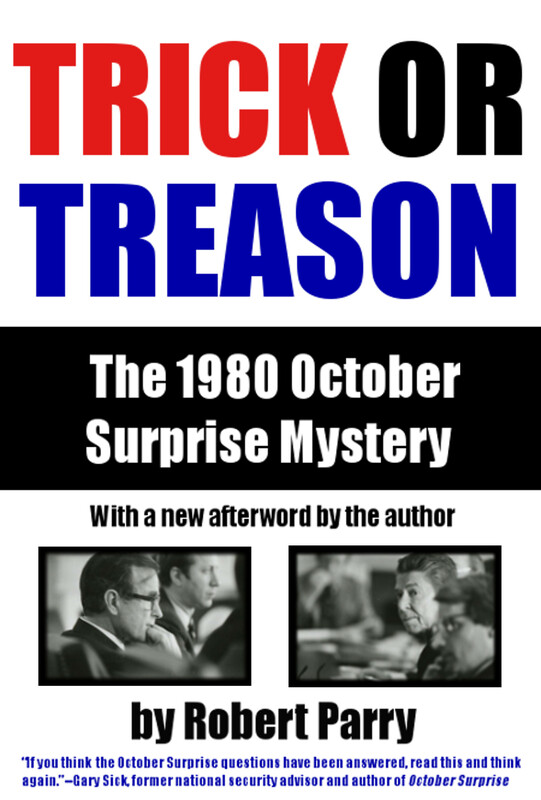 Perhaps this sequence of events—including the deceptive propaganda blitz against Soviet “barbarism” and the hyper-aggressive Abel Archer exercises—is thought of by today’s permanent government of hegemonic warfare as “the straw that broke the Soviet camel’s back”, or some such, and therefore something to be emulated. Such people (if they merit being called that) may see this horrifying grazing of the edge of the abyss as a strategic success, at the cost of only a couple hundred innocent KAL 007 passengers and crew (including a schoolmate of mine). I would love to know whether Ray McGovern, with his knowledge and connections, thinks this is a realistic concern. 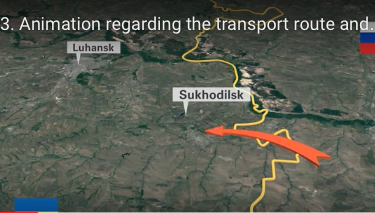 German interviewer Billy Six had performed his own “stand-upper” to “confirm” the alleged Luhansk “getaway” video originally posted by Ukraine’s Interior Minister Arsen Avakov. Six joined the ranks of ARD TV, Correctiv, “60 Minutes” Australia, the Atlantic Council and most mainstream media to promote Higgins and Bellingcat. The JIT report, for all intents and purposes, is an animated Bellingcat “investigation”. It was a botched assassination attempt on Putin. His state plane was flying back from the world cup that day. Although I doubt he would have flown over a war zone, it’s possible that Ukrainian nationalists may have mistaken the Malaysian plane for his plane as they have very similar colors/markings. Even Michael Morrell , former deputy head of the CIA, bragged about how he would like to “threaten Putin’s plane” to send a message. He openly stated this during an interview with Charlie Rose. On a lighter note, that photo of Reagan brought a smirk to my face. Taken early in his administration, it shows him reaching into a bowl of his beloved jelly beans. He turned his sugar habit into a fad by his adoring public. Where did all those beans go? In Syria, you have the legitimate government of the country attacking a rebel bastion (Aleppo), trying to re-unify it with the rest of the country. The rebels are largely imported mercenaries, recruited, armed and trained by Washington, the government, totally indigenous, is supported by Russia. In Ukraine, you have the central government in Kiev attacking a rebel bastion (the Donbass), trying to re-unify it with the rest of the country. The rebels are native people given aid (weapons, supplies and strategy) by Russia. The central government is totally propped up, armed, and trained by Washington. Even most of the government officials are outsiders hand-picked by Washington. Apparently, when America does a thing (no matter how many innocents suffer) it is all good and holy. When another world power (Russia in this case) does the exact same thing, it is the work of the Devil. Do I fully understand the principle here? “Still, the U.S. press might pause to recall how it’s been manipulated by the U.S. government in the past, including three decades ago by the Reagan administration twisting the facts of the KAL-007 tragedy”. But why would it pause, or worry in any way? After all, how many journalists or editors lost any money or career prospects by echoing the government lies? On the contrary, it was those who questioned the official propaganda who tended to find their careers suddenly cut short. As Voltaire remarked, “It is dangerous to be right when the government is wrong”. The letter is dated Aug. 29, 2016, and I would be very interested to find out if the subsequently released JIT report has provided any satisfaction at all to the writers. I doubt it. But how can we find out? This “loaf” is nothing other than a steaming, stinking pile of BM (“Brown Moses”) pulled out of you know where by what journalist John Helmer has accurately described as a NATO agency: Bellingcat. Another excellent piece that should be shouted from the rooftops. But I have a couple of questions. 1) Why not sign it “Ray for the VIPS”? Wouldn’t that have more clout? 2) Why not mention what is to me at least the most glaring weakness of the JIT report, namely the refusal of the US to reveal their “conclusive satellite data”? Giving the neo-Nazi-infested Ukrainian ‘intelligence’ service veto power over the MH-17 evidence investigated by the JIT, is the equivalent of giving the fox veto power over the investigation into the murders at the chicken coop: an insult to the victims, their families and to our intelligence. In October 2014, Dutch journalist Joost Niemöller published MH17: de Doofpotdeal (MH17: The Cover-Up Deal). “The Netherlands, being the country that leads the international investigation, has organized the research of both the Public Prosecutor and the Research Council in a way that makes objective investigation impossible in advance. This arises out of the course of events. Ukraine was the first party to do the research. This is subject to international agreements made by the International Civil Aviation Organisation (ICAO). After several days of secret talks with Dutch FM Timmermans in Kiev, the research was ‘delegated’ to the Netherlands, by means of a series of appointments. The agreements that the Research Council made with Kiev initially were not released, but after all, incidentally posted on the website of the Council. Please note that this happened at the same time when the Dutch government reported to the House of Representatives that those agreements should not be made public yet. “Among other things those agreements include that Ukraine and the Netherlands are committed to a complete exchange of information, that they can force each other to secrecy, and that Ukrainian researchers should participate in the Dutch research. As for the agreements for the Public Prosecutor, these became public thanks to the loose-tongued Ukrainian Prosecutor General Yuri Boychenko, who at a press conference in Kiev on August 10 stated that the countries that have signed the deal […] have veto power over the conduct of the research. So if Kiev does not like certain results, the actual research will be cancelled. The Dutch government is silent about this deal with the Public Prosecutor. “Dutch PM Rutte thus has made himself a puppet to Kiev. The research may have only one outcome: the separatists have done it. Most Dutch probably won’t care very much. 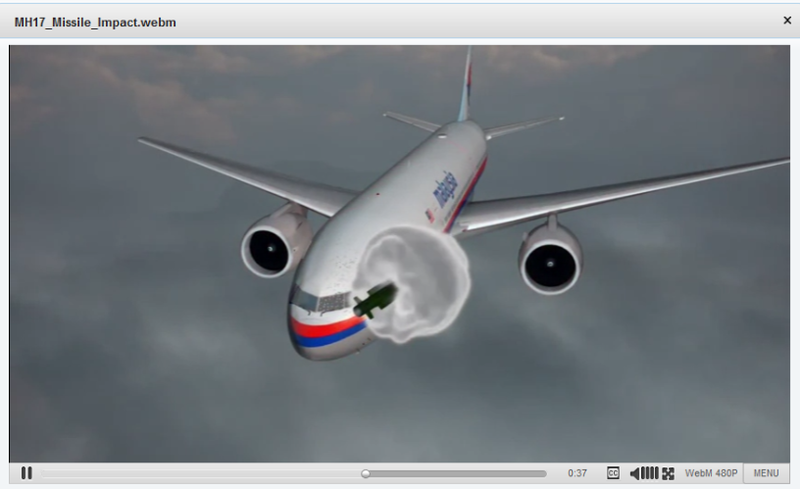 The general belief is that it is the separatists who shot down flight MH17 with a rocket. It only needs to be proven. This also is the general tone in the media, which leads to a tunnel vision. Every ounce that points in that direction, like a vague piece in German newspaper Der Spiegel, feeds the hysteria: ‘We’ve got them, those US satellite photos! It shows that the separatists did it!’ Then why we do not get to see them? “The fact that that piece did not mention satellite photos at all, but only mentioned analyzes of satellite photos, and the fact that German tv station ARD, which also leaked about the meeting, spoke of ‘plausible options’ that reportedly were secretly shared by the Secret Service with members of the Bundestag in a German commission, was overlooked in all the excitement. Comparable news and even facts pointing in the direction of Ukraine as the perpetrator, are ignored by the Dutch media. That’s what’s called tunnel vision. “The discontent can only grow. The deals between the Dutch government and Kiev make it by definition impossible to investigate the site of the crash and to secure evidence (with the exception of the bodies and some luggage). The only thing the Public Prosecutor can do is study images on the internet. Perhaps the metal particles found at the site of the crash will be of good use. But even about that topic a mysterious silence prevails. – Dutch Prime Minister Mark Rutte (13 June 2016) admitted a referendum on whether to back closer ties between Ukraine and the EU had been “disastrous” after Dutch voters soundly rejected the pact. I cannot be alone in feeling like I’ve strayed into a parallel dimension; a through-the-looking-glass world where everything is topsy-turvy. In this sinister, dark and dangerous place, where one set of characters does everything the wrong way round, the Russians are continually set the impossible task of proving a negative. There cannot be a better example of this than Mad Hatter John Kirby demanding Russia provide proof that a Russian aircraft did not violate Turkish airspace on January 29th of this year. This idiotic author should likely consider penning his drivel prior to indulging in copious amounts of adult beverages. His failure to remember the Soviets near week long denial that they had downed KAL-007 is bizarre considering his past employment, and current interests. And then this writer seems to buy into the Kremlin crap that the murderous SOB’s finally decided to release, only when denial became an effort in futility, said crap being that the pilot believed the obviously unarmed PASSENGER JET posed a threat. A lot of women and kids died in that act of barbarism. Comrade Dave exhibits symptoms of “Kremlin” Tourette’s, a neuropsychiatric disorder induced by US/NATO funding. Symptoms include the mindless repetition of the word “Kremlin” accompanied by uncontrollable WORD CAPITALIZATION. The thugs were the US dark state that “accidentally” sent flight 007 over the most sensitive USSR military defenses in Sakhalin, figuring that human shields would prevent diversion of a spy flight. We can see just how much those human lives meant to them. The argument that this flight was not equipped with spy cameras, and just accidentally wandered a thousand miles off course for hours without anyone noticing, is ridiculous and will eventually be exposed. It is quite likely that MH-17 and the other missing Malaysian airlines flight were also equipped for spying, and that this is why we just can’t seem to find our spy data. This would also explain its diversion over the war zone. I find the documentary quite compelling. I also seem to recall that the Russians initially denied any involvement but am not sure, it’s such a long time ago, and I probably didn’t follow the news about the case as I don’t have any recollection of having heard them admit anything after a week. On the other hand, I do recall with more clarity that after the Soviet Union disintegrated, they came clean. As for Ray McGovern’s article, I am of the opinion that this is the best analysis of the case I’ve read so far. I don’t use video reports, as they are just a way to distract from the facts. Why anyone’s expression or background would be taken as evidence I don’t know. It isn’t. But human error by a pilot, two copilots, and three autopilots for two solid hours? Land appearing where it wouldn’t be? What were they doing in the cockpit that none of them or their instruments noticed that they were a thousand miles off? It’s a ridiculous hypothesis, that would take a lot of persuasion based upon people’s expressions and video background, I think. Maybe the soundtrack helped. They were not off thousands of miles, only a few hundred. It’s not a ridiculous hypothesis at all, as most airline accidents these days seem to be caused by pilots not being able to fly the planes and relying too much on their computer systems. Cf. for instance the AF447 accident. But as I said in my previous post today, it may be that it was a spy mission after all. Reading a Finnish blog about “Living Next Door to the Rogue State of Russia” (Finnish media follows the MSM of the West in its Russia bashing) on a web site of one of our esteemed tabloids today, I came across a comment by a Martti Pelho. According to Mr Pelho, our former president Mauno Koivisto’s interpretation of the KAL incident, possibly with information from US government sources, was that the Korean plane was on a spying mission and was deliberately flown towards Sakhalin island so that a US spy satellite above the island would be able to record how the Soviet defence systems were being activated. Furthermore, the KAL flight was delayed by more than 3 hours in Anchorage because of the schedule of the US spy satellite. Koivisto also claims that the relatives of the Korean pilots sought and received financial compensation, damages, from the US government. All this apparently said in Koivisto’s memoirs. I’ll have to check. Now I don’t know what to think, once again, of this particular incident. The explanation provided by the documentary, which I’d seen earlier at least once, pilot error by not activating the INS, seemed quite plausible. But I suppose it’s possible the heading and not turning the INS on were deliberately done, and the US relied on the Soviets not to shoot down any planes. Or they were not at all concerned what would happen to the passengers and the crew. Reply to Dave Winfrey, we’ve got thugs, they’ve got thugs…whether or not you love the new KGB image or hate them, is quite beside the the point…U.S. and Western Occident nations must “make a square deal” with Moscow Now, OR WE”LL ALL BE SUCKING UP PLUTONIUM THROUGH OUR COLLECTIVE NOSE(S) and it’s not a vitamin! Once inhaled, it’s a terribly slow way to die..Of course you may be a Rockefeller type, and I suppose arrangements can be made to rent a large mansion, provided it has a basement (the roof tops will be dusted with atomic debris radiating gamma rays, so sitting sixty feet away from the roof is best) . There are a few multimillionaires who can afford to install HEPA filters at their windows instead of opening them but it’s a hell of a situation to exist in for claustrophobics!…Or for any living creature with a brain larger than a pea to endure!! I’ve found another little essay at a Russian Propaganda Site to go along with this excellent essay. ?The New York Times‘s editorial board has supported every single US war—Persian Gulf, Bosnia, Kosovo, Iraq, Libya—for the past 30 years. While its reporting and op-eds on these wars has often been critical, much of it’s coverage has also helped to sell war-weary liberals on the current military mission—the most notable example being Judith Miller and Michael Gordon’s hyping Iraq’s nonexistent nuclear program in the buildup to the March 2003 invasion. Indeed, the image of The New York Times as an objective, unbiased news outlet is precisely how it was able to sell the war in the first place. Indeed, the image of The New York Times as an objective, unbiased news outlet is precisely how it was able to sell the war in the first place. This was similar in a way to Woodrow Wilson claiming he didn’t want to go to war against Germany while he intended to do just that. Fantastic article Ray, filled with facts and great insights! Of course the leaders knew the terrible truth so this massive propaganda campaign was designed solely to make Americans complacent so they would go along with the war profiteering involved in their leaders’ nuclear arms race. I would predict that the scientists are currently debating whether to move the hands on the Doomsday Clock another minute closer. This is profoundly depressing. I don’t see how we can survive long with a fascist-style propaganda central running the show and European countries grovelling in a fashion which make the old Warsaw Pact seem like a confederation of independent states. The Dutch officials probably know they are part of a propaganda psy-op lie. People like Sanders lending themselves to the Clinton campaign shows the moral bankruptcy of even those previously considered virtuous. Sheldon Wolin’s soft fascism now appears fully blown, and I don’t really see how we can survive unless this becomes a real political issue. Those who vote for Clinton are turkeys voting for Thanksgiving or people voting for nuclear death. It is seeming ever more likely that we will not make it to the November 8th election before a full scale war breaks out between Washington and Russia. This seems to be what the American Deep State wants and intends. 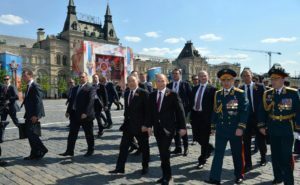 After all of the recent provocative statements (hardly diplomacy) by the likes of Kirby, Power, and Kerry, even Russia, which has tried to keep its cool for the past several years in the face of incessant rash American remarks, is finally admitting that war seems to be the next logical step in the progression. All the Russian media (RT, Sputnik, RI) are basically saying that the United States HAS essentially declared war on Russia, and Russia must be prepared to respond accordingly. Today, responding to Kerry’s ultimatums to stand down in Aleppo, Russia has effectively given Washington an ultimatum not to attack troops of the Syrian Army. The next time Washington moves to attack troops or aid convoys, I fear the game begins. I’m sure Washington thinks that its technical gadgets and advanced weaponry wielded by savages will quickly wipe out the Russian presence in Syria and leave it with its long coveted “victory.” They seem to think this will be Gulf War Redux. I think they are mistaken if they believe it will end there. Russia will give Obomber and his Neue Wehrmacht at least a taste of Armageddon, and where will that leave all of us? Is it worth it to you–Obama, Hillary, and the rest of you warmongers? Produced by the same team that produced Colin Powell’s WMDs-in-Iraq video for his mendacious speech at the United Nations on February 5, 20036? While reading this I could not help but picture John Brennan working into the late hours rummaging around in the old files looking for something, anything, that might be a good plan to make Russia look bad. After all, it isn’t like we haven’t been here before, there must be some…ah KAL007 what do we have here? It’s a war, it’s a plane, it’s Russia’s fault! Great idea, with a tweak here, and a little tweak there, it will make a beautiful false flag to be blamed on Putin. Shoot down a passenger jet, rush to the microphones with the news how the Russians did it, fix the investigation, and impose sanctions on Russia. Hooray we did it, We relived KAL007 of 1983, but now what? To much Joseph Goebbels, and not enough Thomas Paine. Hello Joe, I have heard much about the case of KAL007, even before this wonderful historical reminder by Mr. McGovern. Although the US historical version acknowledges that what was presented at UN was a stitch up, the US version never discusses several strange things about this event, which I remember from the time this happened. Firstly, and most importantly, how does a commercial airliner end up several hundred miles off course, when international airline corridors are only several miles wide and airliners carry a limited amount of fuel? The Boeing 747-230 was a state of the art airliner of the time, although GPS was not available for non-military uses. Secondly, why did its pilots ignore the signalling by the military jet? Apparently, the Soviets let it come to the end of their prohibited zone before they decided to shoot to prevent it from taking away the data collected. I remember that the principal Soviet claim was that US was mounting spying equipment on the civilian airliners of the dependent, or puppet countries such as South Korea and sending them off course to collect information even without the prior knowledge of the pilots. It would have been terribly diabolical to have used civilians as pawns in the spying game, but if MH17 was shotdown deliberately then these two tragedies might have much more in common than Mr. McGovern could imagine. Maybe the notes from 1983 the current plotters were reading had a special recommendation on the use of civilians in airliner plots. Even to this day many facts of KAL007 shootdown are still in dispute (even though USSR does not exist any more), which does not encourage a hope that MH17 will ever be resolved and that the families of the victims will get closure. The only positive outcome of the KAL007 tragedy was that exactly because of it, the GPS technology was opened up for civilian use (at a reduced precision to the military precision). I also remembered that it was said that KAL007 was flying over the most secret Soviet military facilities, to do with Soviet nuclear missile submarines (an absolutely essential tool for disinsetivising the US First Nuclear Strike on USSR). The Soviet nuclear missile submarines were one of the few areas of their technological advantage over US and a persistent target of US spying. Apparently, it is easier to detect submarines from a plane flying at 10 km than from a spy satellite circling the Earth at 100 km or more. Obviously, we will never know the truth. KIza, while you a great deal of knowledge about what happened to Flight KAL007, I on the other hand remember at that particular time I couldn’t help but wonder how that plane flew so far off course. I also believe at that time, that if the shoe had been on the other foot that America would have done the same thing that the Russians did, and that would be to shoot the plane down. There is a pattern to all of these tragic occurrences. Of all the methods used during the process of fulfilling a false flag, it is the use of the media which is the most effective to setting the official narrative. Blaming, demonizing, and being selective with evidence is the pattern used. It’s tried and true, so it must work. I might add that any objectionable criticism of any of these events earns you the title of conspiracy nut. McGovern’s cautions and concerns should be taken very seriously, and if our national media had any sense of responsibility in reporting on our government’s role in the current escalation of Cold War danger, these perceptions need to be fully aired and considered. It’s unfortunate that our relationship with Russia has become an election issue, with Hillary finding she can find further fault in Trump by mocking his reluctance to jump to judgment on Putin’s intentions, while she unloads criticism on his actions. Dangerous when the State Department, Defense Department, and leading presidential candidate are all united in seeking a victory, pinpointing a common enemy, and adding to the demonization of Russia, with our media in full acquiescence. 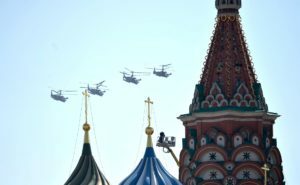 Russia can be faulted, so too can our political and military establishment, but we don’t need a new Cold War, or exaggerate the differences to tempt it becoming Hot. what bothers me about all this warmongering the U.S. is doing is who do they think is going to join them? I live in the UK and I can tell you ther is no appetite for more war anywhere Syria, Ukraine and certainly not in Russia. There was no appetite for US entry into the First World War among the American people while President Woodrow Wilson and his pro-war accomplices were scheming to get the US involved against Germany, but the interventionists persisted and with the alliance of influential politicians in Congress and propagandists in the media enough people were eventually persuaded to join that monstrous period of lunacy. After Thatcher and Blair corrupted the thinking of so many people in Britain hope for a voice of sanity from that once sceptered isle is limited. Fortunately, Jeremy Corbyn has provided evidence that intelligence and humanity still exist in Britain so we must hope, as appears likely, that he will prove to be more stalwart than our Bernie Sanders. In the latter part of the twentieth century Princeton University hosted a research program whose purpose was to scientifically proof the existence of paranormal phenomena. There were a number of people, of a variety of scientific and other educational backgrounds who recognized that the Princeton Paranormal Program could not succeed. These recognized that the program had to fail, either to find scientific proof, or scientifically. I was one among these: Paranormal phenomena cannot exist except in the minds that conjur them and believe in them, either cynically, as purposeful perpetrators, or fondly, as hopefully credulous believers. 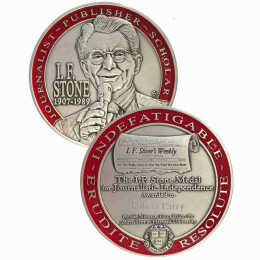 Some among the disbelievers thought the research, which was carried on by sincere scientists, as was well funded, was a waste of time and money. I was not among these. I recognized that for the way the human mind works, a serious scientific project to empirically proof, with the researchers sincerely believing in their effort and sincerely attempting to empirically prove their beliefs correct, and failing, was the only way that science could scientifically counter the desires of the desiring to believe to believe in such desirable phenomena, to scientifically settle the question (which, again because of the way the human mind works, and for the unscientific failures of science, which is also a product of the human mind, will never be entirely and finally settled). Today with the MH-17 case we have a similar situation: A belief in a BUK missile that exists only in human minds. A BUK m issile system that exists in believing human minds for the human mind’s inclination to believe what it is given to believe, and then is reinforced to believe by having the given belief reiterated as a given, as a peripheral ‘known’ that is supportive of a dependent central that is central for being made the focus of a discussion. Thus, we have discussion of a BUK carrier, allegedly filmed in passing here, or there, which may be there, not here, or here, not there, and may be going east, or may be going west, and may be ‘the one’, or not ‘the one’, and may be Russian manned, or may be Ukrainian manned, or maybe Ukrainian Russian, or Ukrainian Ukrainian manned, and so on and so on, in which any actual BUK missile is peripheral, being immaterial to the discussion, that reinforces, by being taken for granted in all of the discussion, none of which is, in fact, about any BUK missile, being all about a carrier, the entirely ephemeral, in the mind only and unsupported by any witness or fact, construction that it was a BUK missile that destroyed MH-17. Go through the evidences with a careful comb: There is no BUK except in discussion. In discussion there is little enough BUK, there is, instead, BUK carrier, BUK statistics, BUK launchers, BUK crews, BUK training, BUK sightings, BUK discussion uphill and down. But no BUK. There is no witness who saw a BUK launch, who saw a BUK contrail rising up toward an airliner, or to disappear into thin clouds, no witnesses who heard a BUK rocket-motor, a rocket-motor with power enough to lift itself, its fuel and a two-hundred plus kilogram payload straight up against gravity thirty-four or thirty-five kilometers, on an arc’d hypotenuse to laterally follow a moving target. But all of the discussion has been about a BUK. A phantom BUK, it appears, since there has been no trace of the actual BUK alleged, except two, apparently remaining out of an original allegation of four, projectile bits, chunks of general shape and size iron, or steel, similar to what are wrapped around the driving charge of a BUK warheads, and any number of other missile warheads whose purposes are to punch holes in aircraft structures, which ,akes them the least confirmatory of components (like pellets that appear to have been fired from a shotgun being put forward to identify a brand and gauge of shotgun allegedly used). What happened to the other two ‘warhead-pellets, if the investigators found them unlike any ever used in BUKs, or if they were copped for souvenirs by inspectors, or what, has not been revealed, which, itself, is peculiar. Ignored, or dismissed, so that the phantom BUK scenario may play solo on the stage, are evidences of air-to-air attack, witness testimonies, military radar paintings, additional entry wounds on the aircraft skin, in locations inconvenient for BUK theory, evidences of horizontal missile approach, evidence of in-structure explosions, etc. The Phantom BUK theory, though unsupported by any direct evidences, supported only by general beliefs in BUKs being around, being transported, or not transported, apparently absent from a transport, and so on, having no support from any witness, anywhere, human or radar, being launched, flying, exploding, or in bits in salvage, is the dominant theory. It is the ‘Princeton Paranormal’ equivalent theory. A theory of a construction whose existence is, to this point, entirely in human minds, with physical evidences lacking or unconvincing, peculiar or suspect, hearsay or wish-say. All of this is interesting. 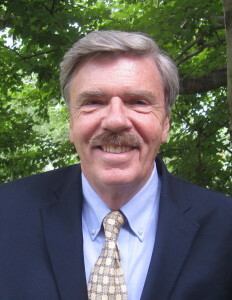 It is as interesting to me as the Princeton Paranormal Program researches were, for the same reason, for the purpose being to prove what the minds engaged are determined to prove, even in absence of physical evidences, even if physical evidences are impossible, even if physical evidences, to be put forward have to be manufactured. It is for what this provides in regard to human minds and their wonderful tenacity when they have a bulldog grip on a desired unreality that the costs in time and effort of the BUK investigation of the MH-17 destruction are well-spent, not wasted. Their contribution to science is something we would never find sponsors to straightforwardly pay for researches in regard to. As for the underlying question, who downed MH-17, that was determined at the beginning, almost immediately, so we don’t have to worry about all the BUK-blathering interfering, or having interfered with anything that was important. The aircraft was downed by Ukrainian government, or Ukrainian government allied parties (whether the parties were allied before or after). This is evidenced by the combination of early blame-assigning and the permission of and participation in obstruction of the investigating in the aftermath of the case: Such peculiarities as permitting an involved, and so potentially responsible, party to participate in the investigating, and granting that party right to veto ‘unacceptable’ conclusions directly implicates that party as a primary participant in the action being given this “investigation”, instead of investigation. It also directly implicates all of those parties who join in, participate in, accept, permit and however they may find themselves able to, facilitate, the obstruction and diversion of the investigation. Exactly. In fifty years, if we survive, rational thinkers will be making light of the “Magic Buk Theory”. I’ve held since DAY ONE that MH-17 was shot down by an Su-25 – speed, altitude and capability all well within actual operating parameters of this SUPERSONIC aircraft. There has never been any empirical evidence to support the Buk theory. Testimony may be “evidence” in a courtroom, but in science, it’s “anecdote”. It’s the same rational error made by “flying saucer” supporters the likes of Stanton Friedman and Lionel Media. They just can’t digest the idea that what they “saw” isn’t what it “was”. The word is not the thing, the map is not the territory, and faith is not truth. This is the fundamental flaw in nearly all human tragedy: we are generally incapable of determining which “abstractions” represent a model of empirical reality. Yours is a great post. Thanks for taking the time to write it. I’m Sorry, F.G. Sanford to burst your bubble there but you are wrong about an important point. The Su- 25 has, to my knowledge, no version that is “SUPERSONIC”. The Su-25 is a ground attack warplane not unlike the American A10 Thunderbolt II. And that was always my problem with that narrative. The Su-25 is one of the worst choices if you want to intercept a civilian Airplane. – The Su-25 needs to be in the air long before the Target is even close. Which in turn means the Target must be known in advance. – The Su-25 must be led to the intercept point by a Ground radar or an AWACS to get the timing right because upon reaching said intercept point the Su-25 has only a small window (mostly depending on the available air-air armament) to engage it’s target. – If the Su-25 misses it’s target window it will most likely not be able to catch up to the target simply because of the low available speed differential. Don’t get me wrong, I’m not saying it’s impossible. I’m just saying that that narrative, especially when using a SU-25 as intercepting plane would need a lot of planning, additional manpower and tools to pull off. It would be an entirely different story if would use a MIG-29 for example. Cass, you’re not bursting any bubbles. You’re confusing the “service rating” of the plane with its actual capabilities. You can go on Youtube, look it up, and listen to an American Air Force officer who actually flew one state that, without external weapons pods, the difference between an Su-25 and an American A-10 ground attack aircraft is that the Su-25 will “go right through the sound barrier”. I posted the link the last time I answered a comment just like yours, but I’m tired of doing other people’s homework. The Su-25 scenario is easily accomplished, and the fuselage damage and debris field are consistent with shootdown by 30mm chain gun fire. If MH-17 was shot down by a surface-to-air missile, most likely it was a Ukrainian SA-11 / Buk-1 M-1 missile. If MH-17 was shot down by a Ukrainian Buk-1 M-1 surface-to-air missile, most likely it was not fired by an autonomous mobile launch vehicle, but by a full BUK-1 missile system complex including a target acquisition radar vehicle, a command vehicle, and a launcher vehicle manned by trained operators. If MH-17 was downed by an aircraft, most likely it was a Ukrainian jet using 30 mm cannon, air-to-air missiles, or some combination thereof. The Gryazev-Shipunov GSh-30 is the standard 30mm cannon armament of the Ukrainian Air Force MIG-29, SU-27 and SU-25 jet aircraft operating over eastern Ukraine. All the US, Ukraine and the EU have ever done is scream, “It was the Russians and/or the separatists!” and hope no one notices the obvious. Visual evidence from the US Key Hole, now codenamed Evolved Enhanced CRYSTAL (EEC), satellite system could eliminate much if not all the speculation about the demise of MH-17. Suffice it to say, the prime armed suspect for the downing of MH-17 remains the Ukrainian Air Force (regardless of whose command it was following), not Russia or the eastern Ukraine opposition forces. Your analysis reminds me of the aluminum tubes! And a ridiculous/tragic presentation by a befuddled General Powell at the U.N. with a cynical/compromised CIA director Tenet sitting behind him rolling his head (who had not long before in congressional testimony said something approximating: “we don’t know if Saddam Hussein has WMD or not. But we believe he is well contained and would not use anything he may have unless we invade and then he’d use what he has against our troops”). 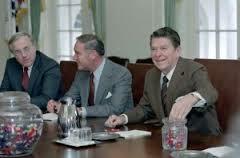 And I think that Negroponte was sitting next to Tenet if I remember correctly. It was such an obvious propaganda ploy at the time and sounded so ridiculous. But it worked. And the MSM just sat back and bought it hook line and sinker. 191. Wenn nun alles für eine Hypothese, nichts gegen sie spricht – ist sie dann gewißwahr? Man kann sie so bezeichnen. – Aber stimmt sie gewiß mit der Wirklichkeit, denTatsachen, überein? – Mit dieser Frage bewegst du dich schon im Kreise. 192. Es gibt freilich Rechtfertigung; aber die Rechtfertigung hat ein Ende. There has been more than two years of “government assessment” fiction from the U.S. State Department. 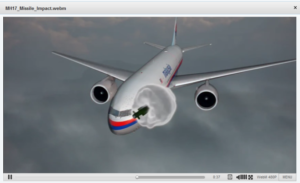 On September 28, 2016 the Joint Investigation Team (JIT) presented the preliminary results of the criminal investigation into the downing of flight MH17. The JIT stated that the United States had allowed the Dutch Military Intelligence Service (MIVD) and the (Dutch) National Public Prosecutor on Terrorism to “view the underlying state-secret (intelligence) material”. On September 29, 2016, a media event in London by the Atlantic Council, presented in partnership with Bellingcat and Mikhail Khodorkovsky’s Open Russia organization, featured a discussion panel with Eliot Higgins and aviation attorney Jerry Skinner. Higgins and Skinner discussed the role of Bellingcat “findings” in “helping” Skinner compel a “Lockerbee moment” in a lawsuit lodged at the European Court of Human Rights. Lawyer’s tricks (Skinner and Kerry) notwithstanding, it appears that U.S. state-secret (intelligence) material is very much available for viewing. Or not. The senior USIA official wrote, “The moral of the story is that all governments, including our own, lie when it suits their purposes…. Funny that, I always thought that a proper statement should have been: “especially our own”. If the US government rates a 10 for being the worst liar on the planet then there are lots of 9.9s out there keeping our liars company. While government lies are an obvious problem it is made much worse by the masses of people who are so gullible as to believe their alleged leaders’ mendacity. There was a time when national leaders would have been banished or, in some cases, expected to commit suicide if they were tarnished by scandal. Now they just hire some PR flacks and continue business as usual without a peep from the people. The promoters of the war on Iraq are a prime example. Despite the fact they were responsible for the worst blunder of this century and a crime against humanity, they are now talking up other wars, including Russia as a prime candidate. One is our current secretary of state, another is our vice president and yet another is looking at moving into the Evil Office in January. All of humankind, with a few exceptions, lie. That line from Koppel was quoted by Alvin Snyder, who didn’t put the quote in quotation marks. McGovern should be careful with statements like that and, at a minimum, note the fact. Still, The statement looks like something an important rep of the major media would say. Saying ‘We can sometimes accept too easily the government line’, to paraphrase what ‘might’ be a quote, is the same as saying ‘We are independent’. Corporate owned media – within the corporatocracy – is by definition ‘not’ independent. Koppel would have been speaking truthfully had he said, ‘Major media is a government propaganda organ’, which is something that progressives (many who are fake, but set that aside) would know. “Fearing a surprise attack” indeed. I quote this part of your article in a slightly sarcastic tone. During the last G 20 meet, when, I might add, all language interpreter’s were dismissed by both Putin and Obama?, there may have been a mutual agreement to limited nuclear exchange(s). I’m insinuating the likelihood of a carefully planned and executed display of “all-hell’s broken loose” but far from it. I say this because there’s an interesting lack of assassinations (politicians, peace activists and the like) as was the case just prior to WW I, where at least a dozen or more heads of state were killed within the space of a few years. We’ve witnessed at least, so far, one such comparison, ahead of WW II, that is: Mussolini’s (Trump’s) march on “Rome” (Washington DC)..Ask yourself why, no-one is interviewing those powers that be who control the Federal Reserve Board, such as Michael W.R. Dobson, of Schroders plc, London. After all, WW III will be financed by fiat money, won’t it? If so, the representatives of the Rothschild family, London – Bank of England must be interrogated. Even Israel’s own, Miko Peled suggests that real power can be traced from Theodor Herzl, to Netanyahu and other Israeli leaders today. Money, money money, it’s always about M***Y! Perhaps Israel’s puppeteers are the actual source of funding and military instigation acting behind and by, Obama, NATO their encroaching buildups along Russia’s border? Let’s keep in mind Putin’s own style of Hollywood showmanship, such as riding on the back of a black bear..quick image translation…I’m in total control of my Marshals(generals) and Nomenclatura (bureaucrats) ASIDE: Unlike Obama…or Putin’s well publicized, “black-belt” work-outs signalling, yes, America, I can play the piano but violence is my specialty too..all for show but more so, Russian, black humor, I sincerely hope the West is getting the message here? I cannot imagine what Santayana was thinking when he made his obviously wrong statement, quoted above. In fact, it is those who can remember the past who are condemned to repeat it. We are condemned to repeat because the Bozos who make history don’t study the past, or study it selectively, or study glorified reconstructions, and ignore real histories and the realities of real history. They go forward with all the intellectual awareness of rolling pumpkins, again and again, and hit the same walls, again and again, experiencing the same smash-ups again and again, every time as brand-new. Yes, your image of rolling pumpkins is apt. It is astonishing that our public debate and elections are so much corrupted by money that such unintelligent people define the nation’s policy. But of course their coarseness reflects the bullies of business who install them with money, in a system no longer democratic because it failed to see its corrosion by economic power, which concentrated after the Constitution was written. Congress fails to take back power from the rogue Executive branch, and fails to debate policy itself, unable to rise above demagoguery even when it is not bribed. Democracy needs new policymaking mechanisms, such as the debating College of Policy Analysis which I have proposed. The College would protect every viewpoint on every issue, producing commented summaries of moderated textual debates, so that all premises are challenged, analogies examined, deceptions exposed, facts required, and all avenues are explored, before emergencies arise. There must be no room for poor thinking in Congress, but now we have little else; the state of our erstwhile democracy is a disgrace to the nation. Neither Russia nor the pro-Russian Eastern/Southern Ukrainian Freedom Fascist Fighters had absolutely any vested interest whatsoever in shooting down MH17, none, period. They were fully cognizant (even more so than us progressive critics at Consortium News) that the entire spectrum of the Western press and Western corporate-owned mass media would IMMEDIATELY jump on and trumpet any half-baked reports of any type of human rights violation committed against civilians by the pro-Russian Ukrainian freedom fighters. The browbeating would be relentless! Moscow and the pro-Russian Ukrainian Freedom Fighters have a sharp mind that informs them of the heavy handed condemnation and denunciations they’d be the brunt of non-stop across the entire globe if they so much as fired a slingshot at a European or Malaysian box kite! Good point, Drew. Only you’ve got to think that a smart guy like Santayana thought about that and the history he’s talking about is the one you mention, the real History. Thanks Mr. Keith. Undoubtedly Santayana was spot-on. when the boeing went down, within days, kiev ordered massive shelling of the area, so the OSCE and others had to abandon their investigation. that went on for weeks, despite kiev having a massive interest to recover evidence if they knew they were themselves not responsible. The pro-Russian Ukrainian fighters are often fighting Azov brigades which are indeed made up of myriad fascists. Ergo, yes indeed the pro-Russian Eastern Ukrainians are not infrequently fighting genuine fascists. The fascist riddled pro-IMF pro-West Kiev junta had a vested interesting in massively shelling the area precisely so a thorough investigation could never commence since there’s reasonable suspicion the pro-West Kiev gov’t battalions likely shot down MH17 given that it’d be a wonderful propaganda weapon to pin on the pro-Russian Eastern Ukrainian rebels. ok, you mean freedom fighters who fight fascists. i know many on the side of kiev are neo-nazis. but the term “freedom fascist fighters” implies fascists fighting for freedom. “i’ve never heard of “Freedom Fascist Fighters.” You’re not keeping up.